NSF is a file format used by Lotus Notes now known as IBM Notes, is a very popular email client. The NSF files cannot be opened in Outlook directly, but there are ways with the help of which you can view the NSF file data in Outlook. There are manual and automated ways which can let you open NSF files without any trouble. Before moving towards the ways to open NSF files, let’s know the reasons why you want to open NSF files in a different platform. Outlook is the most popular emailing platform, easy to operate and accessible to all. Most importantly you have it installed in your system and want to open NSF file in Outlook. To open any NSF file in Outlook, you need to first convert it into the Outlook compatible format, which is PST. So, to convert NSF file to PST file, you need to perform the export and import process. For this process, the Lotus Notes is required in your system to export the files. Start IBM Notes and click on Open. Click on File and in the menu choose Export. Now, select a destination for your file, after the selection from the drop down select Comma Separated Value or Structure Text. Give a name to y our file and click on Export. Once the process is completed successfully, you will get either of these two; CSV or a Structured Text Export screen. Select the option as per your requirement and click on Ok. So, this is how you export files from IBM Notes; now you need to import these files to Outlook. Start with clicking on the File option. Click on Open & Export and select Import/Export from the options available. Now, select the Import from another program or file option from the list of ‘Choose an action to perform’ and click on Next. On the next window ‘Import a file’ select Comma Separated Values and click on Next. Next, you need to click on the Browse button and select the exported files. In the options section, you will see three options, selected the preferred one and click on Next. Now select a destination for your file and click on Next. Once the process is completed, click on the Finish button. After performing these steps successfully, you will be able to open the exported files in Outlook. How to Open and View NSF file with Kernel? 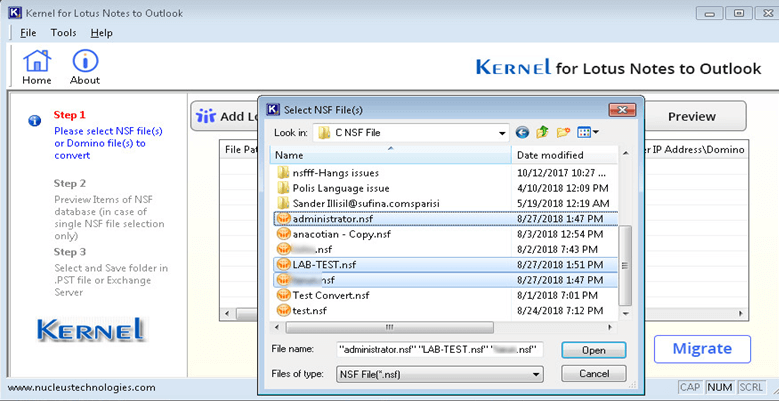 If you want fewer hassles and quick processing, then install Kernel NSF Viewer Free to open, view, and convert NSF files. Let’s see how easy it is. Install and launch the software in your system. Start with clicking on Add Local NSF Files(s). Now select the files and click on Open. Now, select the file and click on Preview. Select the particular file item for the preview. NSF is an IBM Note’s file format; there are limited applications which support NSF. If you want to open and view an NSF file in Outlook, then you can perform the above methods. 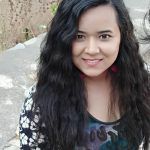 Although, manual method is also a right approach, the automated method is always recommended because of its hassle-free and easy steps. 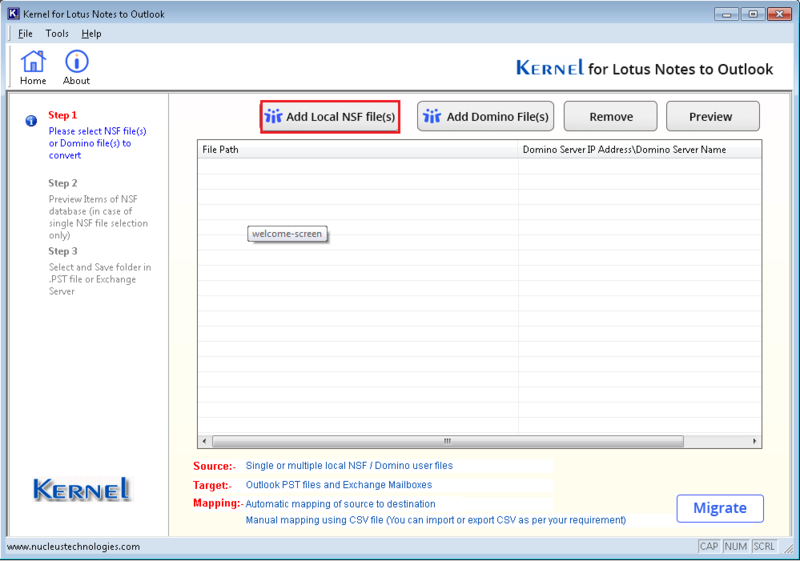 The software comes in a trial version which allows you to open and view NSF files, but with the full version you can convert lotus notes NSF to Outlook file and save them on your system.